Allegro MicroSystems, LLC introduces the release of a three-phase, sensorless, brushless DC (BLDC) motor controller for use with external N-channel power MOSFETs. Allegro’s A4964 is specifically designed for the automotive market with target applications to include engine cooling fans and oil and water pumps. It is designed to provide the motor control functions in a system where a small microcontroller provides the communication interface to a central ECU and intelligent fault and status handling. The A4964 provides the supply and watchdog for the microcontroller and the high-voltage interfaces between the microcontroller and the central ECU and ignition switch. It can also operate as an independent single chip remote motor controller. The motor is driven using a three-phase sinusoidal current drive where phase commutation is determined, without the need for independent position sensors, by monitoring the motor back-EMF (bemf). The sensorless start-up scheme includes forward and reverse pre-rotation (windmill) detection and synchronization, and allows the device to operate over a wide range of motor and load combinations. The A4964 offers three control modes, open loop (voltage) control, current (torque limit) control, and closed-loop speed control which allows it to be used in a wide range of applications. Control mode, operating mode, and bridge parameters are programmed through an SPI-compatible serial interface. A single current sense amplifier provides peak current limiting and average current measurement through the serial interface. Integrated diagnostics provide indication of under-voltage, over-temperature, and power bridge faults and can protect the power switches under most short-circuit conditions. The A4964 is provided in both a 36-terminal QFN and a 32-lead QFP package, both with exposed thermal pad for enhanced power dissipation. 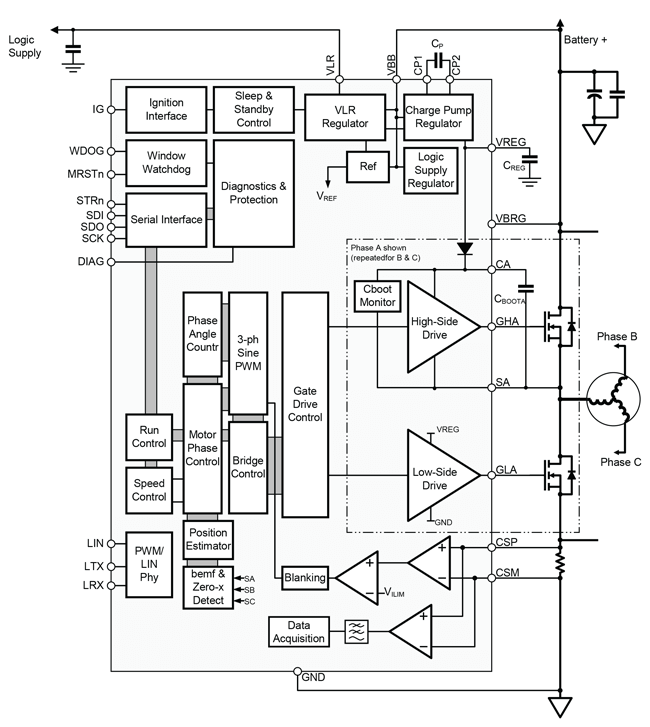 Please click here to download a copy of A4964 three-phase, sensorless, brushless DC (BLDC) motor controllers data sheet. Allegro MicroSystems, LLC is a leader in developing, manufacturing and marketing high-performance semiconductors. Allegro’s innovative solutions serve high-growth applications within the automotive market, with additional focus on office automation, industrial, and consumer/communications solutions. Allegro is headquartered in Worcester, Massachusetts (USA) with design, applications, and sales support centers located worldwide. Further information about Allegro can be found at www.allegromicro.com. SemiElectronics is our own little creation that goes out on a daily basis to scour the Internet for new semiconductor and electronic component devices. Our engineers review this curated data, add supplemental information, and present it here on SemiElectronics.com. It then gets sent out to the engineering community through our social media channels, now numbering about 50,000 active users!